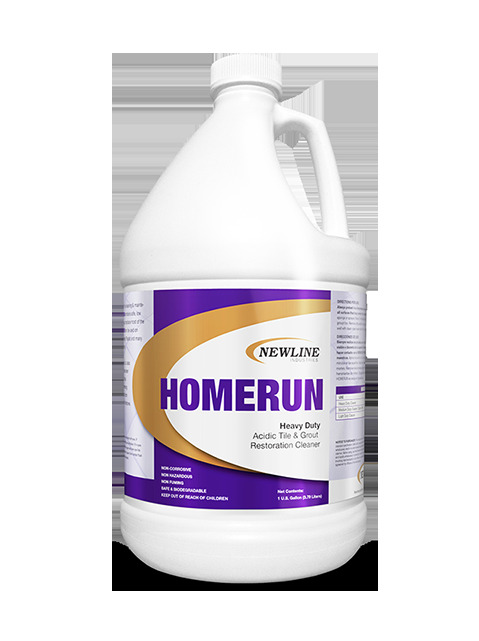 Homerun removes soap scum, light grease, hard water deposits, post installation grout haze while restoring tile and grout. It is especially effective on removing efflorescence. Homerun can be used and will etch concrete, brick, marble, terrazzo, and limestone. Directions for use: Dilute 32 oz. per gallon for heavy duty cleaning. Dilute 16 oz. per gallon for medium duty cleaning or spray refilling. Dilute 4 oz. per gallon for light duty cleaning. Apply solution with a clean mop, sponge or sprayer. Allow 5 minutes of dwell time. Agitate with a sponge, brush, floor machine or grout tool. Remove dirty solution with a sponge, wet/dry vacuum or damp mop. Rinse well with clean water and let dry. CAUTION: Do not allow solution to dry on surfaces before rinsing and extracting.